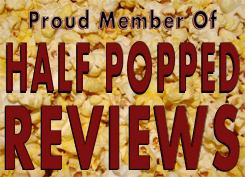 I’ve done this before – my review for the first movie should work exactly the same for the second…there is no difference. There are 26 different directors who are given a random letter, once they are given a letter, they pick a word – and then they are tasked with taking that word and making a short film about death that makes sense with that word. Both the first and second film followed the same structure, and because there are 26 short films in two hours, there’s really no sense in talking overall or individual plots. As I’ve mentioned above, death doesn’t always mean horror. It just means that – death. So among the short films, you’ll run into basically every single genre and “feel” of a movie. Some of these films are funny, scary, weird, alarming, confusing, artsy, animated, and foreign. Believe it or not, each of these short films feel entirely unique, as none of them feel common. They may feel utterly amateur and they may feel extremely professional – but I can guarantee you won’t see what’s coming for any of them – and that’s impressive for such a high count of short films. The first film was promoted with the subtitle “masters of horror” – which kind of signified you might recognize some names in the pool of directors, but neither the first nor second film had any names that popped out…not to my recollection anyways. That normally is something that pushes me away. You know what this movie looks like to the outside? It looks like a cheap horror movie that you’ll never get around to watching – and in a way I swear that’s accurate. This movie isn’t amazing, but there was a lot of hard work that was put into it – and in my opinion, it’s still better than the V/H/S series. However, and this is important, you need to be a fan of anthology movies. I don’t think I’ve seen a single collection-genre film that I’ve actually enjoyed. This is probably a biased judgment, but when I see movies, I have a certain pre-conceived notion of what I truly believe a movie should be – and a bunch of mini movies isn’t among the list. I like movies I can talk in-depth about, and while short films have their place in cinema, you won’t usually see me talking about them because they aren’t my preference. So – if you’re a fan of anthology films, then check this movie out. This series is one of the best I’ve seen from anthology, but that’s not saying much considering my distaste for them in general. 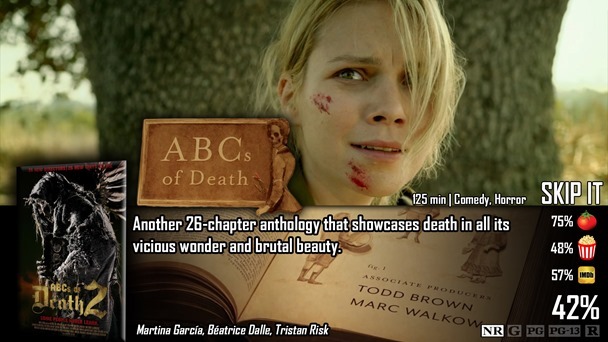 All things considered, The ABCs of Death 2 as well as the original are both anthology movies that shouldn’t be ignored if you are a fan of this genre. You can tell without a doubt that a lot of hard, unique work went into the making of each and every one of these 26 short movies. A lot of these movies are just…they hurt your head. Especially the weird, hard to understand animated features that do their best to confuse and make you question your own sanity. That may be the point, but I wasn’t a fan. I’m also not a fan of anthology films in general, and so…I probably am not the best source for a review – but I am the best source if you don’t like anthology movies.